We built this wall, steps, and walkway in Warren. 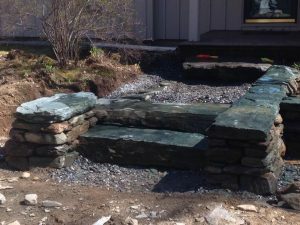 We fabricated all of our steps caps and walkway stones on site. The caps and steps come from a local quarry. It’s called emerald mist and is one of our favorite quarry stones to work with. We also removed 6″ of existing material from the driveway and replaced it with a good 3/4″ gravel. See more project details on our Facebook page! This entry was posted in Walkways and Patios. Bookmark the permalink.